This copper-colored ale is crafted with roasted malts, Belgian sugar, and a touch of wheat for a rich caramel flavor and a smooth toffee finish. The beer pours a clear dark amber with orange hues and a modest off white head. The nose is nice with toasted caramel malt aromas with nutty notes. Not a bad first sip, refreshing and easy drinking but with decent flavors. The taste starts out with a touch of malt sweetness up front followed by an almost cleansing effervescence as this light bodied ale washes over the tongue in the middle of the sip. The back end is very easy drinking with an effortless swallow. The finish is modest but with pleasant caramel malt flavors with notes of oak and toffee. There is very little of any hop presence at all. The final aftertaste is just a hint of lingering caramel malts. 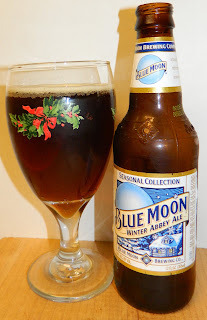 This is a very easy drinking and almost refreshing ale. However there is also nothing special and quite honestly nothing Belgian about it. This reminds me more of an English brown than a Belgian Dubbel; I’m not even picking up the unique Belgian yeast notes. At this warms it is starting to pick up some off flavors. Yeah there is some real unpleasantness as this ale warms. D+ | Blue Moon Winter Abbey Ale is not so good Abbey Dubbel. It starts out as a decent drinkable ale but it goes down hill fast as it warms and is a poor representation of a Belgian Dubbel.